There are many reasons why drivers like to equip their ride with sport truck accessories. Whether it’s to add a sharp design style to your vehicle, make your jobs easier such as hauling or to protect your investment, there are many custom truck accessories available to you. Here is a look at the ten best. 1. Installing running boards is an easy way for drivers to get in and out of their vehicles, especially if they have full sized models. As many of these parts are made of stainless steel this will give your ride a sharp look while providing you durability. 2. Vent Visors are great in that they help give you more visibility while blocking out the elements like rain. Best of all, installation is easy with some companies offering lifetime warranties on these items. 3. One of the more important sport truck accessories you can buy is tail lights. Whether you go with a halogen or LED bulb, buying either ensures you receive more coverage of the surrounding areas, which can add another layer of safety. 4. Truck bed accessories like caps are a great way to protect your truck. As they come in a variety of materials it’s important to select one based on your uses as this will help you buy a product that can handle your demands. 5. 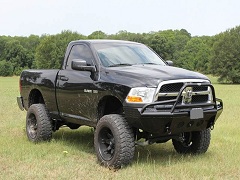 Truck bed rails can add a sharp design ascetic to your truck as well as provide other uses like cargo tie down. Further, many of these are made of steel thereby giving drivers the durability they need. 6. If you decide to tackle rough terrain, off road truck tires will be the perfect accessory for you. These are designed to withstand tougher conditions while providing drivers with superior handling. 7. Grille guards are great sport truck accessories that can protect the look of your ride. When shopping for these check for any made by Westin as Westin truck accessories are some of the best items you can buy due to their construction and design features. 8. You will also want to protect the look of your interior as well. One of the best ways to do this is with floor mats. Many like WeatherTech’s Extreme Duty Floor Liners custom fit to your floor, so your carpet will remain stainless. 9. Seat covers is another viable option for those wanting to preserve a show quality interior or to adapt to a look. You can find many universal ones in a variety of sizes that are durable and provide superior comfort. 10. Lastly, mud flaps are great sport truck accessories for the dual purposes they provide. For one, they can bring a styling element to your truck while also protecting your ride from debris.